Garlic belongs to the Allium genus, which also includes onions, shallots, chives and leeks. Garlic has been used for medicinal and culinary purposes since their discovery in Central Asia more than 6,000 years ago. It was even mentioned in the Old Testament as one of the foods most craved by the Israelites exiled from Egypt (Numbers 11:5-6). Long known for its curative properties, garlic was even used in Medieval Europe as a panacea against the Black Plague and spiritual possession. Long a staple in Asian and Mediterranean diets, garlic is today a major ingredient around the world. 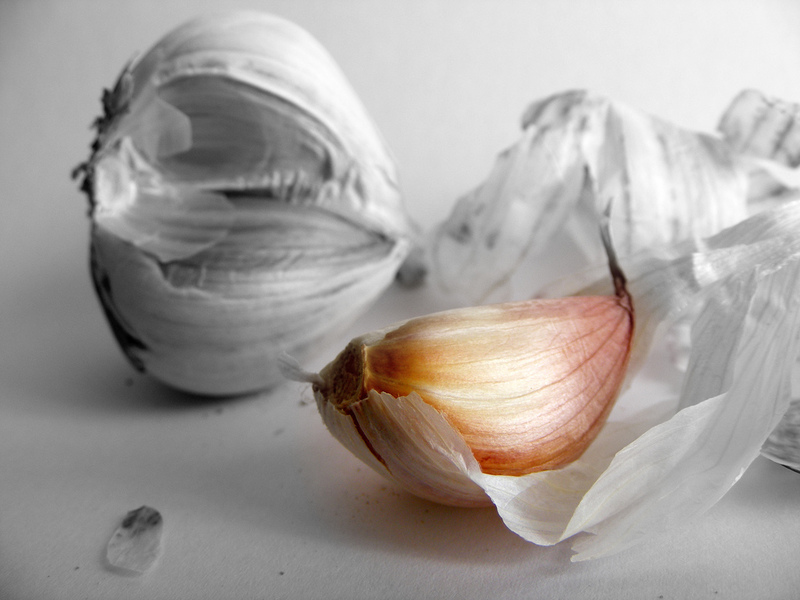 A “bulb” or “head” of garlic is made up of many cloves encased in a parchment-like protective outer skin. Like many in the same family, garlic is grown for its underground bulb which consists of swollen leaf bases that store energy for the next growing season. These energy stores are accumulated as fructose sugars rather than long-chains of glucose (starch), as with other plants. All members of the Allium family have distinctive tastes due to their specific volatile oils containing sulfur. This sulfur-like flavor is a natural defense that deters animals from eating the plants. The plant takes up sulfur from the soil in which it grows and converts it into a form held in storage. Raw garlic has a crunchy texture and a spicy, intense flavor. Cooked garlic is soft and spreadable and has a distinctive sweet and savory flavor that makes it a versatile ingredient in so many cuisines. Different garlic varieties can be distinguished by the color of their outer skins and the presence of a central stem (a “hardneck” garlic typically has a few large cloves around a hard central stem versus a “softneck” which has several rings of cloves with smaller ones towards the center and almost no central stem). In the U.S., the most widely-used and most commonly found variety in the supermarket is softneck and white-skinned grown in California. Other varieties of softneck are the Silver Skin which has a smooth skin and a strong flavor and the Artichoke variety which are larger, can have a purple-streaked skin and a milder flavor. Hardnecks have a relatively short season and more commoly locally-sourced. Rocambole, also called Spanish garlic, is a hardneck garlic with a white shiny skin with a spicy flavor similar to a shallot. Purple Stripe, another hardneck variety, has purple markings, has a mild flavor when eaten raw which transforms into a sweetness when cooked. Garlic is a staple of world cuisines, and is used either raw or cooked. The preparation influences the flavor, with crushed or finely cut imparting a stronger flavor than coarsely cut or whole. When garlic is added to a marinade or in the first stages of cooking, its flavor infuses the main ingredients and its own flavor typically mellows. When added during the final stages like in a dressing, its strong flavor is immediately evident. Raw garlic is commonly used in marinades and dressings based on oil, wine, vinegar or added to dipping sauces, mayonnaise or yoghurt. Finely sliced, minced or crushed garlic can be added to oil or butter in the initial stages of stewing, stir-frying or sautéing. Whole heads of garlic can be roasted and the softened cloves squeezed from the skin and spread on bread or added to meats or vegetables. When roasted, garlic develops a nutty and sweet flavor which can also be a nice addition to marinades and dressings. Look for bulbs that are full, firm and tight with intact skin. Fresh garlic harvested in the early fall is moist; dried garlic develops a more concentrated flavor as the vegetable is stored year-round. Garlic should be stored in an open container in a cold and dry place or can be hung to allow better airflow. The cloves should remain firm, never mushy. Garlic should be peeled before consuming and is best to enjoy the vegetable fresh. The strong, distinctive taste of onions and garlic is intended to prevent animals from eating the plants. Alliums absorb sulfur from soil and incorporate it into various, stored, chemical compounds. When chewing breaks the cells of these vegetables, an enzyme that can catabolize the stored compounds are released, and the strong, burning taste of free sulfur molecules results. Pounding, chopping, and mincing garlic each produces its own distinct flavor as the released sulfur molecules react to form different products. Raw, chopped onions or garlic should be rinsed prior to eating. This is to remove sulfur deposits from surfaces, which can become stronger-tasting with continued air exposure. A large-scale EPIC study demonstrated that a diet high in garlic and onion consumption was assocated with a 21% risk reduction for ovarian cancer. Case control studies in Italy and Switzerland have demonstrated that moderate to high consumption of onion and garlic reduces cancer risk. A moderate frequency of 1-7 servings/week to a high frequency of 7 servings/week reduce risk of colorectal, prostate, ovarian, and cancers. A separate study investigating the possible mechanisms behind these cancer fighting effects found aged garlic extract to inhibit colorectal carcinoma cell proliferation and epithelial blood vessels from proliferating and migrating thus inhibiting tumor cell development. Allicin, one of the active components in garlic, is formed when alliin within garlic is activated by the enzyme allinase when raw garlic is chopped, crushed, or chewed. Native alliin tends to be higher in garlic grown in high sulfur content soil. The anti-tumor properties of garlic have been recorded as early as 1550 BC in ancient Egypt. Hippocrates also reported garlic as a way to retard cancer growth.